Bits & Scraps Of My Life: Are they EVER going back to school? Are they EVER going back to school? Happy Wednesday! Are you keeping warm? My goodness......I don't know what is up with the weather here. A couple of weeks ago it was 70 degrees and they past few days we have had single digit temperatures and below zero weather at night. WHAT THE HECK???? I live in the south!!! Granted, not the deep south, but we aren't used to single digit temps here AT ALL! We had a tiny bit of snow on Sunday night and Jesse was so excited. They were scheduled to go back to school on Tuesday but it was called off due to cold temperatures. Yes I'm serious. Go ahead and laugh at us northern folk.......I'm shaking my head as well. Then last night we got the call that they were taking today off as well. Seems that 25% of the buses were broke down due to the cold weather. You'd think they would put buses in a garage or something? Or do routine maintenance and check things like anti-freeze? Sooooooo they are still home and really beginning to get cabin fever. Jesse and Brandon are loving the time off but Steven has had enough of his younger brothers and is ready to go back to school. I'm ready too!!! They are eating me out of house and home!!! Our high temp for today is 21.......lets hope that's good enough for them to return tomorrow!! If they are off tomorrow I'm just keeping them home thru the weekend rather than go one day and then have the weekend off. Now watch a blizzard or something come thru and they will be stuck in my house FOREVER!!!!! Between all of the whining about being bored, there's nothing to eat, and fighting over who's turn it is to watch tv or play the xbox I did manage, somehow, to get a layout done. Cuz I'm super mom :) lol. 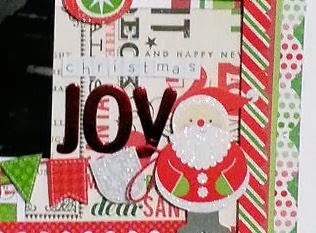 Right before Christmas I bought some sper cute stickers at Hobby Lobby from Doodlebug Designs. I had no clue they were part of the Home For The Holidays collection.I just knew they were cute! I never sued them because once I realized there were things to go with them I wanted them!!! I can't justify spending any money right now (Bob is out of work and filed for disability, we are living on savings and prayer) Not a lot of money anyway.....but I did get some papers from Hobby Lobby's Paper Studio line the other day that matched pretty well. 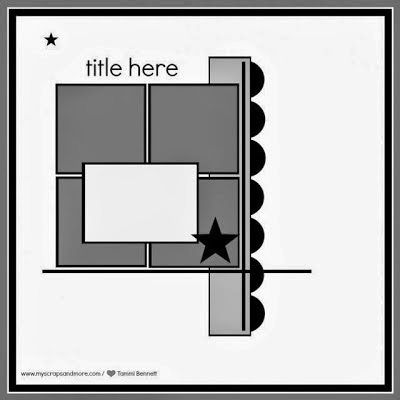 So I used them to created this layout . I took inspiration from My Scraps And More Sketch Blog's sketch from their recent blog hop. I had Soooooo much fun with this one and really went nuts with the sticker sheets :) I popped most of them up with 3D foam for dimension. 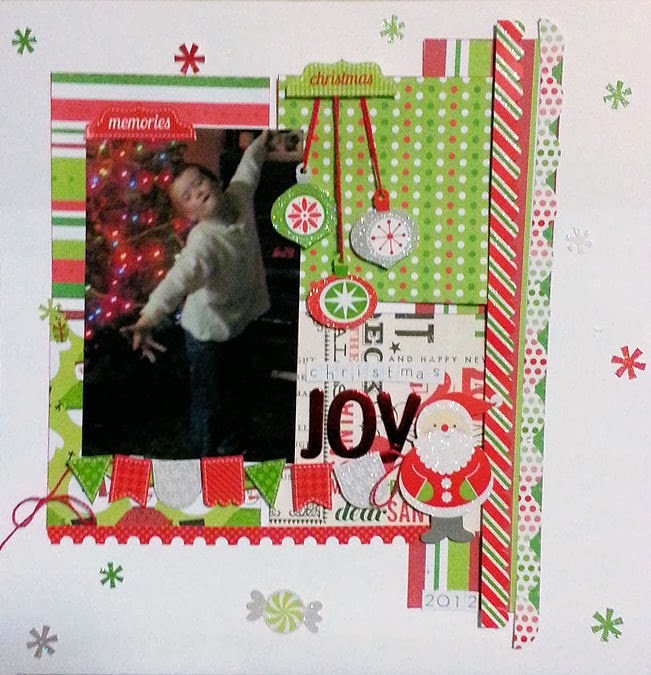 In addition to the Doodlebug and Paper Studio I used alphas from American Crafts. You can't see that the "Joy" is actually red foil and the tiny letters are hard to see atop of the text on the paper i used (ooops)but they are from Remarks (also AC). I used some twine in my stash to create the banner (Loveeee banners) and to string the ornaments. I'm pretty happy with hose this oje turned out! Thank you so much for your visit today. I hope wherever you are you are keeping warm and getting some time to create something beautiful :) Keep those fingers crossed that my crew goes back to school tomorrow!!!! such a fun page and love the line you used!! Cute banner!!! Thanks for playing with us at My Scraps & More! I know what you mean about the cold temps. it is the same here also. Freezing cold. I like the LO and the sketch that you used. I will have to try this sketch for sure. Great layout! Love the colour combination (and the pose hee hee). Thanks for playing along with us this week for the "something new" challenge at Shopping Our Stash! Love all your Christmas elements and banner!! Thanks for playing along with us at My Scraps and More!! Come visit us .. it's 70 here! LOL! I love love love your lo! LOVING the colors and the ornaments!!! super sweet page! Thanks for playing with us at My Scraps & More!! Beautiful LO! Thanks for sharing your holiday inspiration with us at CropStop! Fun take on the sketch! Thanks for playing with us at My Scraps & More! Thanks so much for stopping by and for all your kind words!! Here is a link to my Christmas blog where in my last post, I talk about where do i store everything..